The ‘March of Millions’ opposition protests in Moscow on May 6 turned into a bloody standoff between demonstrators and riot police. Regional journalist Leonid Kovyazin was one of many arrested still to be released. Ekaterina Loushnikova travelled to a village in Kirov to speak to Leonid’s family, friends and colleagues. 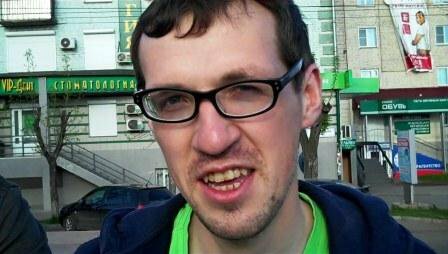 On 5th September 2012 Leonid Kovyazin, a video cameraman and journalist working as a freelance correspondent for the independent weekly Kirov newspaper ‘Vyatsky Nablyudatel’ (Vyatka Observer), was arrested for taking part in the ‘mass riots’ of 6th May. He is currently being held in Moscow’s pre-trial detention centre No. 4, along with other people detained in connection with the Bolotnaya Square fracas. If convicted, he could spend between three and eight years in prison. Leonid Kovyazin was in Moscow as a freelance correspondent of the regional newspaper Vyatka Observer on the day of the 'March of Millions'. Police have accused him of overturning portable toilets to build barricades against them. He faces a wait until November to be tried and the possibility of up to 8 years in prison. The old woman looks at me hopefully, her wrinkled bony hands clutching her knees, but there’s nothing I can tell her. All I know is what anyone can find out from the internet: Leonid Kovyazin could get up to eight years in prison for taking part in mass riots during the ‘March of the Millions’ in Moscow on 6th May, the day before Vladimir Putin was sworn in for his third term as Russia’s president. So his grandmother may not live to see his release. ‘The investigator suggested we look at a clip on YouTube, called “Demonstrators Smear Themselves with Excrement”. It showed Leo touching a portable toilet that had been moved by young protesters. And for that he might be sent down for five to ten years. I said, surely you don’t put people behind bars for that? They replied that the rioting on Bolotnaya Square was extensive, that a lot of riot police had been injured… That people have to answer for their actions, and that a court will decide what happens to Leo, but that it will certainly mean prison. We’re all still in a state of shock here, everyone on the paper! Leo used to film an interview programme for our website, and now we haven’t got a cameraman. The Vyatka Observer has asked its readers to donate money to a bail fund for Leonid Kovyazin: they need to raise 500,000 roubles. There has been a good response, with some readers offering 100,000, some 1000, some only 100 roubles, but the fund is gradually growing. The question is whether Moscow will change its ‘pre-trial restrictions’ and release the journalist on bail. Many believe that this is unlikely, since the case against him is clearly being orchestrated from above and he can’t expect any favours. 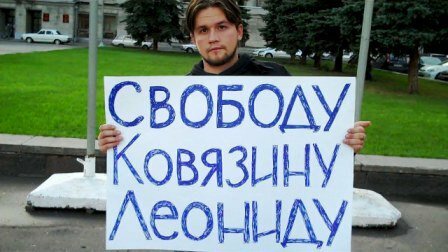 Friends in Kirov have not forgotten Leonid Kovyazin, organising pickets demanding his release and donating money to a bail fund. Civil activists Tatyana Zhdanova, Anton Dolgikh and Artur Abashev wrote to Kirov’s liberal governor Nikita Belykh, asking him to stand as guarantor for Leonid Kovyazin. They recently received his reply, where he wrote that ‘according to the Criminal Code of the Russian Federation, a guarantor must be able to guarantee that the individual for whom he offers surety will appear in court and participate in investigative procedures’, and that he is unable to give such a guarantee. However he is prepared to make a contribution to Leonid Kovyazin’s bail fund, if the court decides that he may be released if he signs an undertaking not to leave Moscow. As I leave the theatre the actors are rehearsing a scene from ‘Stupidville’, the name of Saltykov-Shchedrin’s town and the title of their show. The scene is about a mayoral election, contested by two powerful local ladies: the German Amalia and the French Clementinka. One regales the townspeople with beer, the other with vodka; they drink the lot, dance, have their election meetings and then doze off again until the next election... So it goes on until they finally elect as mayor a man so terrible that ‘the earth shook and the sun grew dim’, and whose reign of terror and destruction brings the town’s story to an end. Editor’s note: Besides Leonid Kovyazin, 16 other young Russians were arrested in connection with the demonstrations on 6th May. They were: Andrey Barabanov and Artyom Savelov (unemployed), ‘Left front’ activist Vladimir Akimenkov, businessman Maxim Luzyanin, students Yaroslav Belousov, Stepan Zimin and Aleksey Polikhovich, Mikhail Kosenko (who is registered as disabled), former marine Denis Lutskevich, research chemist Fyodor Bakhov and human rights campaigner Nikolay Kavkazsky. Some are being detained in custody awaiting court decision; others have been released on bail. One 18 year old anarchist, Alexandra Dukhanina, is under house arrest. All the ‘Bolotnaya prisoners’ have been accused of participating in a riot and using violence against police. Specifically, Kovyazin is charged with moving portable toilets, Dukhanina with throwing stones and businessman Luzyanin with chipping a policeman’s tooth enamel.